Venue : Office of the Mission Director, National Health Mission, Assam, Saikia Commercial Complex, Christianbasti, Guwahati-5. 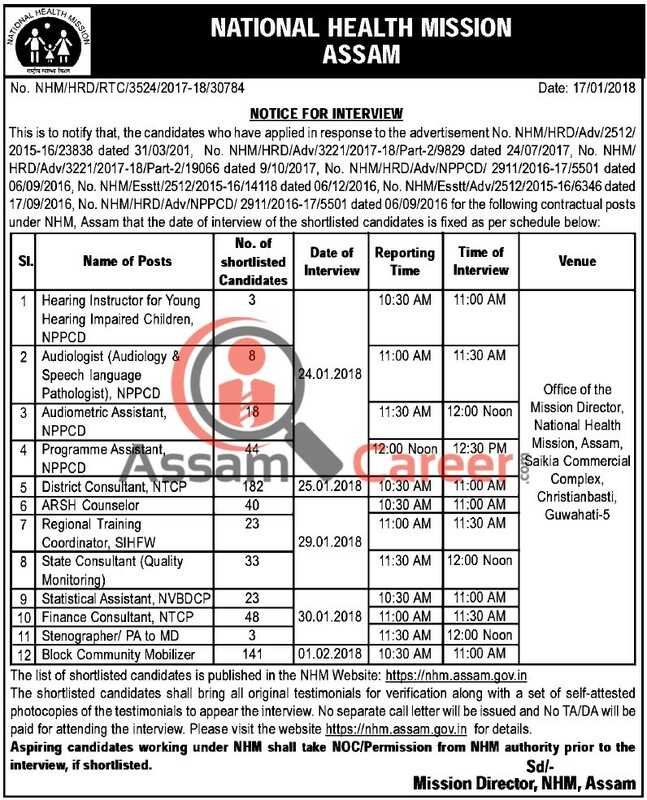 The list of shortlisted candidates is published in the NHM Website: https://nhm.assam.gov.in/ . The shortlisted candidates shall bring all original testimonials or verification along with a set of self-attested photocopies of the testimonials to appear the interview. No separate call letter will be issued and No TA/DA will be paid for attending the interview. Please visit the website https://nhm.assam.gov.in/ for details. Aspiring candidates working under NHM shall take NOC/Permission from NHM authority prior to the interview, if shortlisted.